That’s what Mayor Geoff Dawe quipped when asked what he and Justin Trudeau discussed when the latter made a whistle-stop tour of Aurora last June, including a campaign stop at the Aurora Public Library. 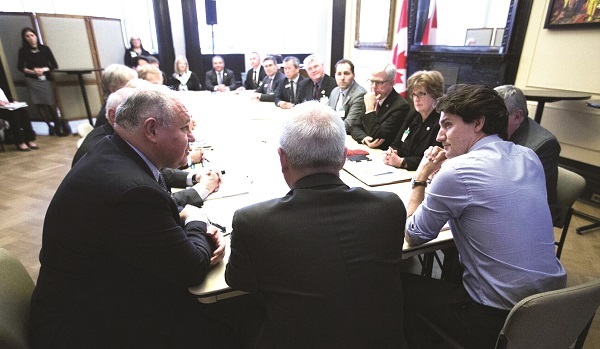 In all seriousness, Mayor Dawe said at the time he was struck by the Liberal leader’s “charisma”, and last week he was glad to see not much has changed as he joined his fellow mayors from the Region of York for a meeting with the new Prime Minister to discuss issues important to the area. He didn’t say whether “bags of money” were an issue on the table, but it wouldn’t have gone amiss in addressing some of the issues they did present to the Prime Minister. When it comes to transportation, there will be some significant issues that will need to be considered by all levels of government, particularly when Aurora is part of the first stage in Ontario’s all-day two-way GO Train service and Rapid Express Rail. From Mayor Dawe’s perspective, the biggest opportunity to come out of meetings like these is to “engage” senior members of government in the issues that matter at the local level. “You can’t take the risk that they will know who you are,” he says. “You have to get out there and make sure they know who you are. Like any other good relationship, you have to remind them why you’re so special.